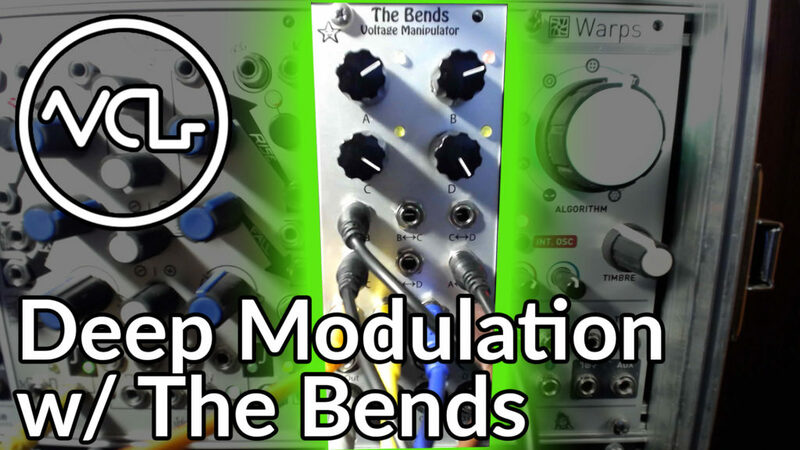 The Bend is a deceptively complicated module. It consists of 4 channels, A through D, each with a dedicated input, output, inverted output and attenuator. With nothing patched, the attenuators act as DC offsets, sending held voltages from the output (and inverted voltage from the inverted output). Patching an audio or CV signal to the input on a channel, the knob controls the level of the incoming signal. The six crossfading modulation inputs are where The Bends takes a left turn. A four channel voltage offset/attenuator is already complex. However, these CV inputs cause the input signals to be shifted between two or more outputs, allowing for incredibly intricate fluctuating voltages. Try setting two of the channels offset attenuators to different settings, then modulating the crossfade input between those channels. In the video, I demonstrate this with channels A and B, and the A<>B modulation input using an LFO from Maths. Instead of using DC offsets, CV or audio signals can be routed to the channel inputs. Try routing a slow LFO to one channel, and a faster LFO to another, and crossfade between them. As the signals are faded together and mixed, the resulting CV signal starts to adopt characteristics of each, resulting in a more complex, modulating shape at the output. The inverse shape will be available at the inverted output (if the main output is increasing into the positive voltage, the inverted will do the opposite, decreasing into negative voltage). The Bends is a deep device, that demands exploration with many types of signals. As the signals are modulated and faded into each other, interesting and unexpected motion tends to reveal itself. Modulation sources like the Malekko ADLFO, Voltage Block or Ornament and Crime pair well with The Bends, which can make use of all of the straying voltages. 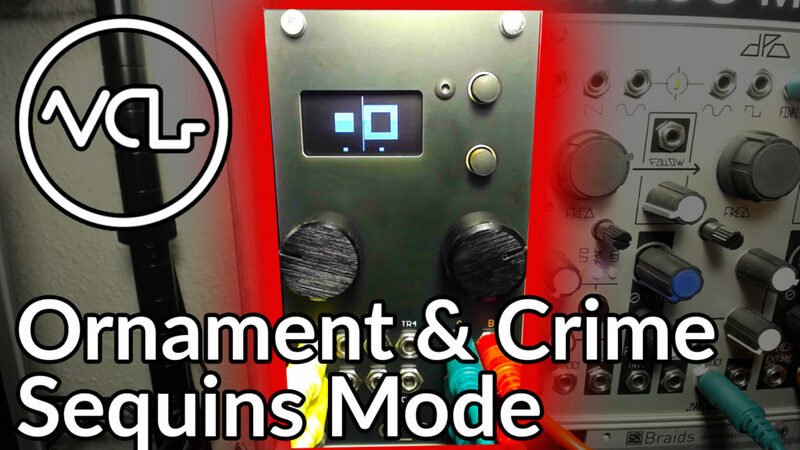 How are you creating complex and interesting modulation voltages? Tell us about it in the comments! 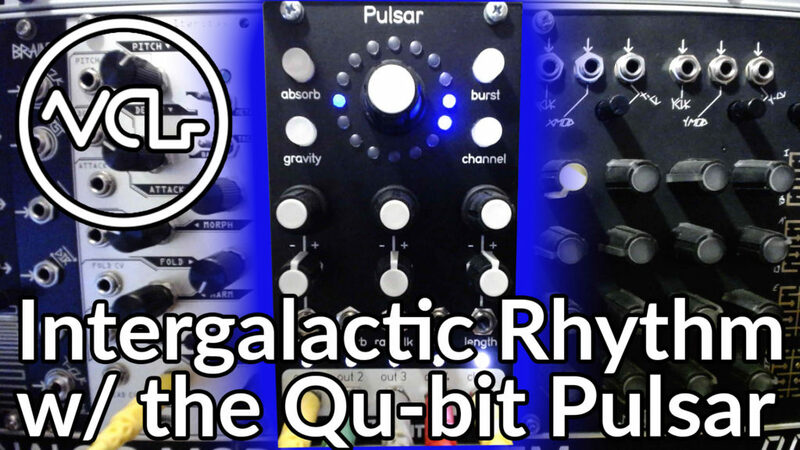 The kind folks at Qu-bit Electronix have sent along their fun rhythm pattern generator, Pulsar, for examination. You may already know that we are complete fanatics for Euclidean Rhythms here at Voltage Control Lab… Pulsar delivers a playable interface for creating Euclidean rhythms and combining them with programmed gate sequences as well as binary and random patterns. Pulsar is an extremely powerful tool. It features 4 independent channels of gate pattern sequences, each able to play from 1 to 16 steps backwards or forwards. An additional output carries the internal clock pulses, which can be timed anywhere from 5ms to 16 seconds between steps. Each channel features a built in clock divider and multiplier, or they can be decoupled from the internal clock, allowing for independent tempo control. Pulsar has 4 main modes, a sequencer (which allows the user to create custom patterns by turning the main encoder, and pushing it to enable or disable the selected step), Euclidean rhythm generator mode (see the video below for an explanation of this technique), a binary number pattern generator (another interesting and unique implementation of binary values, see the Mystic Circuits’ Vert) and a random pattern generator (a great tool for subtle or dramatic pattern manipulation). The module offers control and CV modulation of sequence mode, clock rate/division/multiplication and pattern length. There is also a gate input to activate burst mode, which allows for patterns to be played as one shots rather than loops (push the length encoder to enable or disable pattern looping). In addition, the absorb function can be gated from an external source, acting as a pattern reset function. This module is endlessly enjoyable to play with. The pattern combinations are so fun, and features like gravity mode (which causes a pattern to accelerate through the loop like a bouncing ball) offer a different kind of programming flexibility. We’ll be back to examine the global parameters of Pulsar in a future video. How are you generating interesting and complex gate patterns? Tell us about your techniques in the comments! This week, we’re examining another mode in the deep and complicated Ornament & Crime, called Acid Curds. 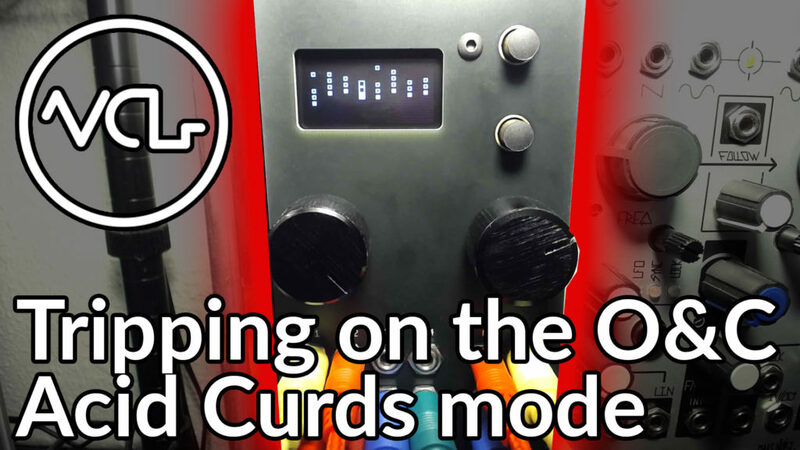 While the module contains a few different chord sequence generating tools, Acid Curds is extremely programmable and can give the user a bit more flexibility than the tonnetz based modes. Acid Curds is a chord progression sequencer, with four different 1 to 8-step chord progressions that can be chained together end to end to create up to 32 step harmonic sequences. Chord quality, voicing, inversion, root key and octave can be programmed or modulated on each step of the sequence. Sequences are quantized to one of dozens of available scale shapes to produce musical results, with the common Ornament & Crime scale masking and base note functionality. The progressions can be chained in similar fashion to the sequences in Sequins mode. There are a few different ways to chain them together, including having them play back end to end, triggering the toggle action, or using a CV input to shift the sequence position. Individual sequences can be played back in forward motion, reverse, two different pendulum modes, random and Brownian probability over sequence direction change. The four outputs on the module are typically going to be routed to four separate oscillators 1V/octave inputs. These oscillators should be tuned to the same frequency before patching from Ornament & Crime, so they can be appropriately detuned to fit the selected chord shape. Trigger input 1 acts as a clock as well as a sample and hold trigger to capture and quantize any incoming CV signal at CV 1. Trigger 2 can be used to advance a step in the current chord sequence, while Trigger 3 will advance to the next progression, and Trigger 4 resets the progressions. Acid Curds also features an extreme CV assignment page, allowing the four CV inputs to be routed to modulate virtually any parameter in the mode. These include sequence length, chord attributes, transposition and many other critical functions. With CV assigned to transpose as well as control inversion, voicing and quality, the module takes on the form of many other chord based modules. How are you generating chord sequences in your system? Tell us about it in the comments! Mystic Circuits is known for some far out module design, like their extremely fun gate sequencer, Vert. Now Eli and the Mystic Circuits team have developed a new floating module system in the tradition of external mults, called 0HP. These innovative, business card sized modules dangle from or rest on your eurorack system, performing basic but crucial functions. 0HP “modules” are ingenious. Simple passive circuits (requiring no additional power source) rest at the heart of these open source devices. Available assembled or in DIY kit form, the 0HP line provide important tools that any modular user might need. We all need more VCAs. Perhaps the most useful device in the line is the VCA/AND Gate, a passive VCA with an additional trigger output. When a signal is patched to the input, AND the CV input recieves a high voltage, the signal is sent to the output. With a gate, we get the AND logic functionality. When an envelope is used instead, we can shape the amplitude of the input signal over time. The circuit might be passive, but it can handle audio rate modulation, applying amplitude modulation to the incoming signal for some deep tonal manipulation. The OR gate is another handy device, combining two CV or gate signals to a single output. This circuit can be used as a simple mixer with no attenuation, making it useful for many purposes. The module works well as a gate sequence mixer as well, allowing the signals from both input 1 OR input 2 to pass to the output, a fun tool for combining a steady a pattern with a more complex one for fills or embellishments. 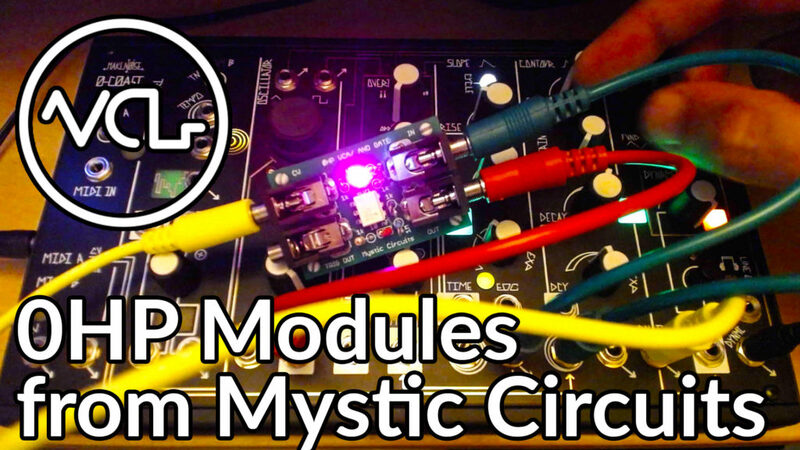 Mystic Circuits has just released two more 0HP modules, a vactrol based VCA and a vactrol based low pass gate, offering more options for shaping the character of your patches without the cost in rackable modules. What external devices are you using with your modular system? Tell us about it in the comments!